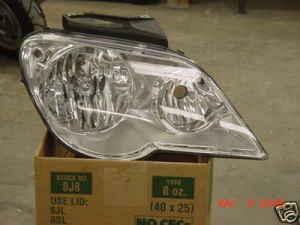 THIS IS A 2004 - 2007 CHRYSLER PACIFICA RT HEAD LIGHT. THE LENS HAS 3 SMALL CHIPS ON THE EDGE, BUT YOU CAN BARELY SEE THEM ONCE INSTALLED IN THE CAR. THE OEM PART # IS 51130600AC. THE GRILLE LIST FOR $189.00 BRAND NEW. THIS IS A GREAT CHANCE TO GET A GREAT LIGHT FOR CHEAP.